Extending the exposure lets you select a cell and extend it to the desired frame. In the Timeline view, select the cell you want to extend. Right-click and select Extend Exposure. In the Timeline View menu, select Exposure > Extend Exposure. Select Animation > Cell > Extend Exposure. In the Extend Exposure dialog box, enter the frame number to extend your cell to. Indicate if you want to insert the new frames before the following exposure or overwrite it. If you select insert, any following exposure will be moved down. if you select Overwrite, the following exposure will be erased and replaced by the drawing being extended. NOTE: You can also select the last cell where you want to extend your drawing to (such as the last cell of the layer), right-click and select Extend Exposure. You will not be prompted the dialog box. In the Xsheet view, select the red arrow in the cell’s right side. Make sure you see the drag down cursor. Pull down the selected cell to the desired frame. NOTE: The red selection box must be visible when releasing the cursor. If not, the action is considered cancelled. From the top menu, select Animation > Cell > Extend Exposure. The Extend Exposure dialog box opens. 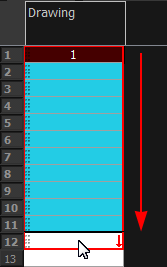 Enter the frame number you want to extend the cell to.